Peel all the vegetables (except the onions) and grate them with the smallest part of the grater. Make sure there are no chunks. Add the grated vegetables with the salt, cilantro, onion, garlic, tomato paste and milk in the blender. Blend to obtain a purée. In a small sauce pan warm olive oil with the achiote powder and let it all mix well. Keep a close eye as the achiote powder can burn easily if the oil is too hot. Add this oil to the blender and blend again to combine. To assemble the pasteles, take pieces of plantain leaves of about 10’’ x 10’’, and rub each leaf with a little oil. Add about 3 tablespoons of the purée to the center of the leaf and top it with about 1 1/2 tablespoons of the filling. Fold up the sides and ends and tie the packages with cooking string. Wrap once more with parchment paper or aluminum foil, if desired. Repeat this procedure until all ingredients have been used. Boil in a large pot full of water for 45 minutes. Carefully unwrap and serve. You can freeze the pasteles to eat at a later date. 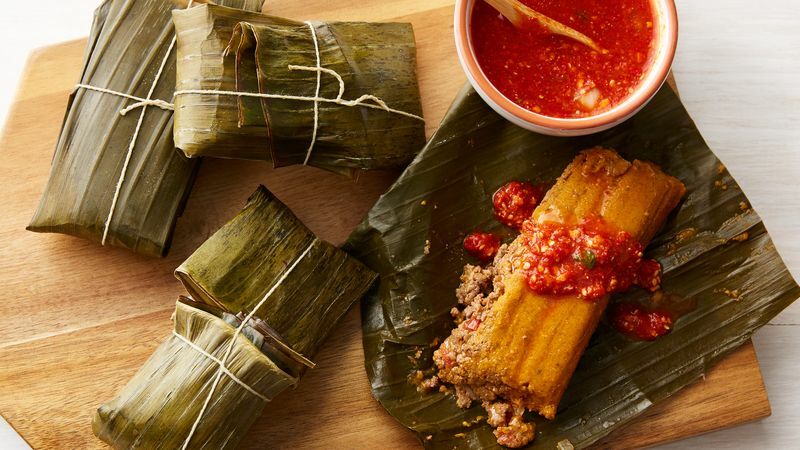 Pasteles en hoja, also known as Dominican tamales, are the quintessential holiday dish served in countries like Puerto Rico and the Dominican Republic. A filled masa wrapped in leaf, this recipe combines all the flavors loved by Dominicans. Families gather together to make big batches of pasteles which are then stored in the freezer to keep enjoying them as much as possible during the month of December.